This section will have information about how inclusive research can be done and links to resources which will help people doing inclusive research. 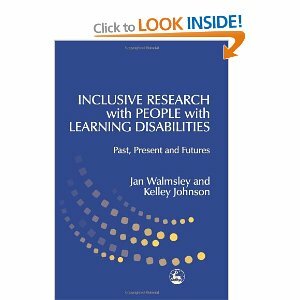 Inclusive Research with People with Learning Disabilities: Past, Present and Futures. by Jan Walmsley and Kelley Johnson. To look inside this book or to purchase this book from Amazon please click here. Please contact us to add further resources to this page. You can contact us using our contact form. We are hoping to add an inclusive research bibliography (a list of videos, websites, articles and books) to this site ….